Image caption Dutchie will be part of panel discussion in Bristol this week on mental health in the music industry. Artists battling mental health issues have spoken out about the "volatile and competitive" nature of the music industry. Musicians from Somerset and Bristol will share "painful experiences" at an event on 6 March to raise awareness. Organisations will discuss why it is "hard to find help" to help tackle the issue at Bristol's Trinity Centre. The talk stems from a recent survey which found 80 per cent of musicians suffer stress, anxiety and depression. Victoria Bamber, head of campaigns at Skiddle which commissioned the survey, said mental health in the music industry needed to be brought to the public's attention. A spokesman Help Musicians UK, which will be part of the panel discussion, said: "The precarious nature of a musician's work, the connection between their art and identity and other myriad complex pressures can leave musicians vulnerable". In response to The Prodigy singer Keith Flint's recent death, they added: "For generations, the music industry has lost some of its brightest talent and Keith Flint's sad passing highlights the continued need for support for musicians and those working in the industry." Image caption Dutchie said: "Get outside more, eat well, do exercise, don't isolate yourself, try to stay off social media as much as possible." 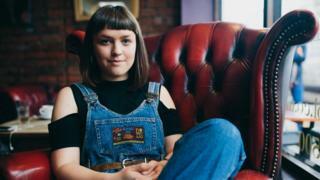 Bristol-based producer and DJ Dutchie, 23, from Devon, said: "People making sexist comments make me feel inferior or stupid. "Late nights and drinking, lots of travelling and time away from family and friends, the constant artistic struggle of 'am I good enough?'. "Also, a lot of art stems from painful experiences, and although the act of music making can often be a therapy for working through these it is by no means a straightforward process". Image caption Ben Osborne said: "Mental health issues are demonised and romanticised in equal measure." Ben Osborne, 31, is a musician and composer from Bristol, currently based in Berlin. "As a solo artist and a composer for commission, my work can often be very lonely, which can trigger some negative stuff and leave me in a position where it's hard to find help," he said. "I am someone who suffers badly from anxiety, including panic attacks, as well as depression. "Financial insecurity, undue pressure, competition, a lot of drugs and booze, a lot of loneliness, a lot of prejudices in the industry against the young, the old, against some genders, against some races - all of these contribute." Image caption In response to the Prodigy singer Keith Flint's death, Dr Meaker said: "We never know really know what’s going on behind closed doors and it is extremely sad for all involved." "Extreme working hours and also the pressures of having to maintain the public image you set for yourself can contribute to mental health issues as an artist", said 39-year-old Dr Meaker from Somerset. "The music industry is also a very volatile and competitive place where one minute you could be doing super well and the next minute find yourself out of favour and fashion." Image caption Bristol-based artist Zion Flex said: "The music industry is fickle like that. We rely on the good will of others to survive." Zion Flex from Bristol said her experience of the music industry "has been largely negative". "Very few people cared that I struggled with depression," she said. "Most people ignored me and isolated me. My race only compounded this. "When there is nowhere else to turn we can always write our songs. Unfortunately sometimes writing a song is not a cure."